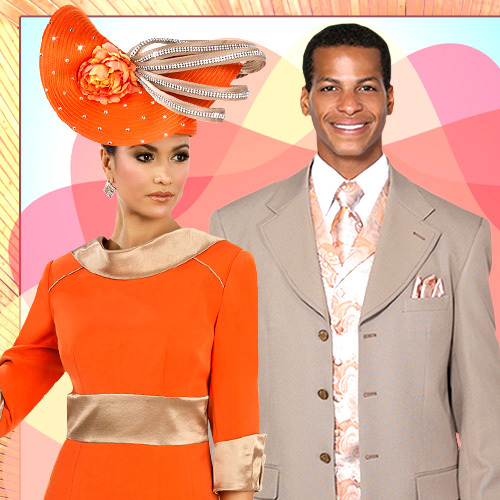 2pc Novelty and silky twill women's church suit. 2pc Novelty and silky twill ladies suit. 2pc Lace and silky twill women's church suit. 3pc Novelty ladies church suit. 3pc Crepe ladies church suit. 2pc Silky twill women's church suit. 3pc Lace ladies church suit. 2pc Netting womens church suit. 2pc Lace and silky twill ladies suit. 2pc silky twill ladies church suit. 2pc Silky twill ladies suit. 3pc Silky twill ladies suit. 2pc Silk look women's dress. 3pc lace and silky twill ladies church suit. 2pc novelty ladies church dress. 3pc Lace and silky twill womens suit. 2pc Novelty and silky twill first ladies suit. 3pc D-Crepe first lady suit. 2pc Women's suit in silky twill and lace, rhinestone buckle, lace applique on jacket with cami and skirt. 3pc Women's suit with silky twill jacket, rhinestone buckle and brooch and swirl pattern brocade cami and skirt. 3pc Women's suit in silky twill with brush stroke pattern brocade, rhinestone buckle, jacket, cami and skirt. 3pc Women's suit in diamond pattern brocade, rhinestone clasp, bow and pin on jacket, with cami and skirt. 3pc Women's suit in silky twill with floral pattern, rhinestone buckle, jacket, cami and skirt. 2pc Women's suit in french renova fabric with satin and lace trim, tulle fringe sleeves and skirt hem, rhinestone buckle jacket and cami. 3pc Women's suit in silky twill and scalloped jacket with rhinestone closure, textured leaf pattern cami and skirt. 2pc Women's suit in textured fabric with ruffle trim, rhinestone buckle, jacket and skirt. 3pc Women's suit in silky twill and rhinestone trim and buckle jacket with lace cami and skirt. 3pc Women's suit in silky twill with scallop stripe pattern, rhinestone button closure, jacket, cami and skirt. 3pc Women's suit in stripe pattern, rhinestone buckle, jacket, cami and skirt. 3pc Women's suit in shimmer shantung, cascading rhinestone embellishment and buckle, jacket, cami and skirt. 3pc Women's suit in lace and silky twill, rhinestone buckle, layered cuff, jacket, cami and skirt. 3pc Women's suit in silky twill with bold stripe print, rhinestone button closure, jacket, cami and skirt. 3pc Women's suit with marble brocade jacket, rhinestone clasp and silky twill cami and skirt. 3pc Women's suit in silky twill with unique criss-cross weave shoulder, rhinestone buckle, jacket, cami and skirt. 3pc Women's suit in crepe with half-sleeves, embroidered and scalloped edge, jacket, cami and skirt. 2pc Women's suit in crepe with lace trim, rhinestone buckle, jacket and flare skirt. 3pc Women's suit in crepe, rhinestone buckle and trim, ruffled trim sleeve on jacket and hem of skirt with cami. 3pc Women's suit in crepe with folded fan embellishment, cascading rhinestones and buckle, jacket, cami and skirt. 4pc Women's pant suit in crepe with floral embroidered trim, pearl and rhinestone embellishment, rhinestone clasp, jacket, cami, skirt and pant. 2pc Women's suit in crepe with satin piping, rhinestone button closure, jacket and skirt. 2pc Women's suit in crepe with notch collar, single button closure, jacket and skirt. 3pc Women's suit in silky twill with rhinestone and enamel brooch, rhinestone button closure jacket, cami and skirt. 3pc Women's suit in silky twill with notch collar. rhinestone buckle, jacket, cami and skirt. 3pc Women's suit in silky twill with rhinestone clasp and brooch, jacket, cami and skirt. 3pc Women's suit in silky twill with rhinestone buckle, jacket, cami and skirt. 3pc Silk Look Ladies Church Suit With Class Brooch. 2pc Renova Designer Church Suits For Womens. 2pc Women's suit in crepe fabric, three button closure, pleated jacket and straight skirt. 3pc Renova Ladies Suit For Church With Slimming Paneled Jacket And Skirt, Rhinetsone Button And Brooch.